Protect your car from ethanol’s harmful effects! Ethanol attracts, absorbs and holds water. When enough water is absorbed, the ethanol and water mixture will separate from the gasoline and settle to the bottom of the tank. If this separation occurs, the fuel is rendered useless and must be drained. This moisture causes corrosion in the fuel system and at worst, could cause serious engine damage. Ethanol is alcohol, which is mildly acidic and corrodes metal components in the fuel system. Corrosion causes deterioration and failure to components. Heavier deposits occur in lower concentrations of ethanol-containing gasoline, such as E 10 or E15, because ethanol is not compatible with the traditional detergents in gasoline. The ethanol increases gasoline’s tendency to oxidize and degrade. Deposit formation can also interrupt the fuel/air ratio, which causes severe drivability problems such as inefficient combustion and hesitation. BG Ethanol Fuel System Defender Service contains corrosion inhibitors that coat fuel system components protecting them from corrosive acids. The fuel system is safe and fuel flow is optimal. In addition to corrosion protection, this service will neutralize these harmful acids. BG Ethanol Fuel System Defender Service creates a stable solution with gasoline, allowing more water to pass harmlessly through the fuel system before gasoline and water begin to separate. This service cleans the entire fuel system and keeps it free of damaging deposits. Regular use will restore engine performance and gas mileage, lower exhaust emissions and reduce drivability problems caused by deposit buildup. Deposits accumulate on intake vales, injectors, ports, fuel, injectors and combustion chambers causing poor fuel economy, power loss, rough idle, hard starting, knocking and a plugged fuel filter. The ethanol is corrosive when it comes in contact with the metal components of modern day vehicle fuel systems, and highly, if not extremely, corrosive on older classic cars. The nature of ethanol is very hygroscopic, meaning it absorbs moisture right from the air. So any loose water already in the tank or each time you expose your tank to the atmosphere (i.e. the opening of your purge valve, which helps maintain the pressure of your gas tank or even opening your gas cap when you are refueling) the ethanol immediately attracts the water. The main problem arises when fluid separation occurs. This is when the gasoline and the ethanol (now blended with water) literally separate inside the gas tank. The gasoline will be on top while the ethanol and water mixture sit at the bottom of the tank. Bigger problems happen to those who drive and let their gas tanks get lower than one forth…or even worse have the E light come on before they go and refuel. Now imagine, that ethanol and water concoction being sucked up and your poor engine trying to burn it. However, it’s not combustible without the gasoline. Granted this is an extreme scenario, however, with the regulations pushing higher ethanol mixtures on consumers in the near future it will not be so far fetched. For now, the corrosive effects will take over most vehicles and drivability concerns will be on the rise. The new BG Ethanol Fuel System Defender Kit includes a cleaner: BG Ethanol Fuel System Defender, PN 213, and a drier: BG Ethanol Fuel System Drier, PN 281. BG Ethanol Fuel System Defender Service is formulated to inhibit the free radical oxidation mechanism, which causes ethanol-containing gasoline to degrade. Add to the fuel tank each oil change to keep intake manifolds, intake ports, intake valves and combustion chambers clean and free of damaging deposits typically caused by ethanol-containing gasoline. BG Ethanol Fuel System Defender is an excellent fuel stabilizer and corrosion inhibitor. Ethanol-containing gasoline is highly susceptible to water accumulation which can cause corrosion on fuel system with water and gasoline allowing more water to pass harmlessly through the fuel system, without affecting the combustion process. Added at each oil change, the BG Ethanol Fuel System Defender Service will defend fuel systems and engines from the destructive effects of ethanol, particularly E10 and E15. But for corrosion protection, added to the fuel tank at each fill-up, BG Ethanol Corrosion Preventer, PN212, will restrict fuel oxidation, gum and varnish formation typically caused by ethanol-containing gasoline. BG Ethanol Corrosion Preventer also protects the fuel system by neutralizing acids in the fuel and by protecting metal components with corrosion inhibitors. It will keep the entire fuel system clean and restore power and fuel efficieny. •Can any vehicle use ethanol-containing fuel? No. Older vehicles have fuel systems containing plastics, elastomers and metal alloys that may not be compatible with ethanol. In order to be compatible with ethanol-containing fuel, special fuel system hardware, sensing mechanisms and algorithms in the on-board computer are necessary to make adjustments to the fuel/air ratio. But, every gasoline-powered vehicle manufactured since the early 1980s can use up to E10. However, above 20 – 30 percent ethanol, the computer in the non-flex fuel vehicles cannot make the adjustment and a lean fuel/air mixture will result. E85 fuel can only be used with flex fuel vehicles specifically designed for operation on fuel with high levels of ethanol. •Can ethanol-containing fuel cause fuel-filter plugging? Yes.If a fuel supply system is switched from conventional gasoline to E10 to E85, much of the sediment, oxidation residue and other contaminants in the storage tanks and lines are dissolved or suspended in the new fuel. These contaminants may find their way to the filter until a sufficient amount of ethanol-containing fuel has been turned over. Ethanol-containing fuel also contains water, which carries dissolved salts and contaminants, and can cause premature filter plugging and injector fouling. But, if the fuel storage and delivery system are clean and well maintained, no additional filter plugging should occur–outside of what is typical for conventional gasoline. •Can ethanol-containing fuel corrode the fuel system? Yes. Ethanol is a mildly acidic molecule. Acids accelerate the corrosion process, particularly in iron-based alloys. But it can accelerate corrosion to aluminum, brass, bronze, silver, lead and other alloys found in the fuel system. Protect the fuel system by neutralizing acids in the fuel with an amine-based dispersant, such as polyether anime, and adding corrosion inhibitors (the BG Ethanol Fuel System Defender). We know you have a choice of who you trust to service your car or light truck. We would love the opportunity to earn your trust and business. We offer a maintenance program for most cars and light trucks that will warranty any mechanical breakdown forever. Thats right, FOREVER! All You need to do is have all of our recommended services at the correct intervals. We take care of the rest! It doesn't get any better than that. about a repair. The reliability of the services received is unbeatable. 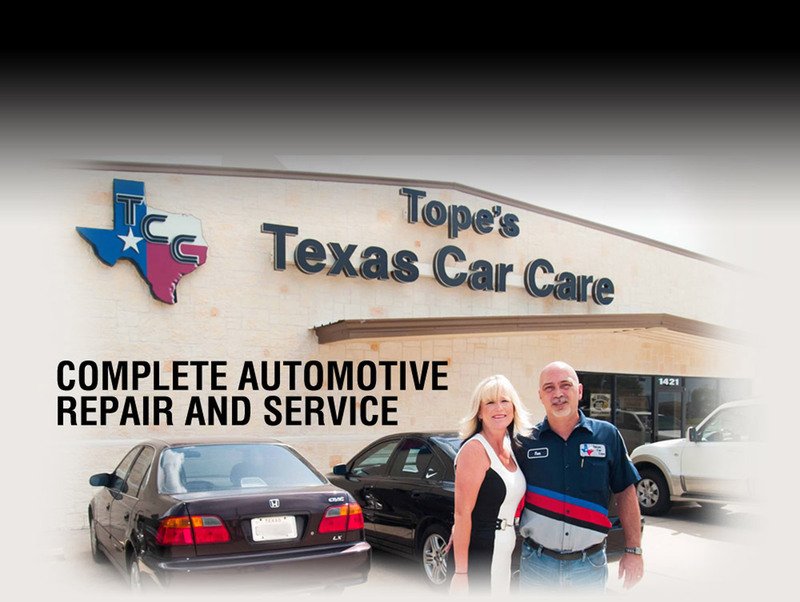 Copyright TOPe's TEXAS CAR CARE. All rights reserved. Website Design by Crest Media, Inc.